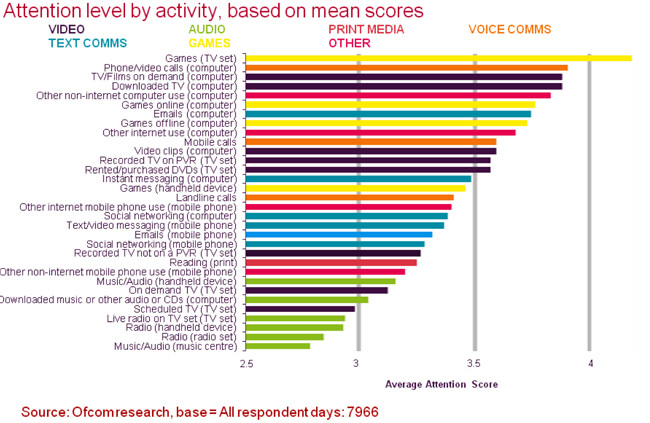 But are raw sales and time spent (vs engaged) meaningful metrics in a multi-device context? What should we be looking at – perhaps digital marketing is a good barometer? The tendency though is to put ad dollars in the least risk areas and as Greg Satell pointed out here the percentage spent on digital marketing is still only 15% of the total with 85% on traditional areas – I would suggest it is too much effort for some ad agencies to really look outside their 50 year old model. Would it be a nonsense to decide on public funding levels for innovative multi-platform projects based on the proportion of ad spend between ‘digital’ and traditional? Are the ad companies levels of understanding of user engagement the most reliable? From an innovation and cultural angle it is critical to look closely at user/viewer engagement with a nod towards the marketing status quo and its more refined metrics. Are the users in these publicly funded countries truly engaged with traditional media? May it have become wall-paper background for more social, interactive and playful pursuits? The UK Offcom report from Aug 2010 it highlights major shifts in engagement alongside big jumps in multi-tasking, adding multi-interactive channels. Media multi-tasking where, for example, a phone call is made while surfing the internet now accounts for 35 per cent of all media consumed throughout the day and the younger the person, the more media activity is done at the same time. Among 16-24s, over half (52 per cent) of their media activity is simultaneous, compared to just over one fifth (22 per cent) for people aged over 55.
according to a recent study from Deloitte. Data from “State of the Media Democracy” indicates that while watching TV, 42% of US viewers are online, 29% are talking on cellphones or mobile devices, and 26% are sending instant messages or text messages. When people did two-screen, 65 per cent said the internet had most of their attention, with only 14 per cent saying the TV did. The annual Nielsen report, which surveyed about 5800 Australian internet users aged 16 and over, found overall internet consumption jumped by a record four hours a week last year among the group, from an average of about 17 hours and 36 minutes in 2009 to 21 hours and 42 minutes. So approx 10% of public money is spent on developing interactive projects yet 50% of the time younger users in the UK are on interactive platforms. Are they being reached by the 5 night festival art film shown in the dusky backstreet cinema or the latest public service TV-drama or the clever multi-projector art installation – more importantly will they bother to watch these when they make their on-demand video viewing choices, on their many video devices? Do they even know or care that this content exists? Are there better ways to spend a nations money so it creates services that actually reach the nation? So is the public funding of creative projects and services heavily skewed towards the older generation and those less engaged with the creative services being produced. Even if you demographically balanced the equation and factor linear video (film/tv) being watched on different platforms should the funds still amount to 9 times for linear video vs more interactive platforms? Part of the problem here for those managing the funds is the big shift towards linear video content being viewed on-demand. On-demand implies the viewer is requesting that content, which then simply suggests the theory ‘if we find out what they are requesting, we can get a real sense of what they find valuable’ – nothing I have ever seen that drives funding decisions really looks at the detail of content consumption and even more how engaged are they with that content. 1 Defining Multi-Platform – How can you fund that, which cannot be described? The way overall multi-platform funds are labelled is a very vague & results in a blunt instrument. Although it appears complex on the surface to the uninitiated there are easily defined areas of multi-platform. Even though we use the term multi-platform often 70% of the projects submitted have their ‘hub’ on one plus a few satellite platforms – which makes it easier to classify. As a judge at events, having run my own call for submissions over the years (at least 550 projects) and adjudicator on public fund submissions MP projects range from copycat of existing services through to niche art installations and a handful of what I would call a strong, integrated multi-platform story based propositions (transmedia). The Big ‘Label’ – In most of the funding body documentation all the “new stuff” at least 10 definable areas, are still lumped under a few, hazy umbrella terms such as Digital, Innovation, New Media, Interactive, Cross-Media, Now Media, 360, Cross-Platform, Transmedia and the oddest new example ‘All Media’? Digital is a nonsense term now given the migration of traditional into digital platforms and we assume innovation is pretty generic across all areas including traditional media. Eventually we won’t need a catch all and linear TV or Radio for example will be listed alongside other distribution platforms or service types bu at the moment ‘multi-platform’ is the preferred descriptor in the US and UK that can have within it sub-divisions such as rich integrated ‘transmedia’ – there are also many courses springing up that have multi-platform as its focus, production or content. The Little Labels – From most funding bodies we have at the moment, in terms of multi-platform project call outs, the equivalent of a vague ‘Send us a film proposal‘ – without any reference to type, genre, commerciality, format, doco vs drama, story styles, levels of innovation etc: etc: This often results from getting advice from ‘doing it now’ commercial parties too busy to see the bigger picture or have their own agenda in keeping it vague and subjective. It is important that one funding body gets really clear on the labelling and the corresponding MP funding ‘pots’ only then will it move things forward. It will help those submitting and those adjudicating. In a world of multiple platforms (including TV, film, radio, outdoor) there needs to be a classification, yet most film focused funding agencies just don’t put their necks out on this one. SOLUTION: Although new MP formats are arriving quickly it is important there is a simple agreed way of describing what kind of project it is exactly. Although putting it in a ‘labelled box’ may sound premature in some circles, without this the problems mentioned above will prevail. The DRAFT list below is a very simple 3 way matrix which can be used to get a sense of the project to help define level of funding for a type of project, any specialist help required before, during and after and a way to manage numbers funding across certain categories – eg: 25% mobile, 30% not for profit, 10% experimental and so on. It is a ‘get the ball rolling’, debate list. In Group 1 we have Business Intention – to make a profit or ‘spend’ (on issues, advertising or experimentation). Group 2 is the type of project, the format which will quickly explain what it is in the same way we would say it is a CG animated short, or a TV detective series this provides a starting point. Finally Group C describes the core distribution technology. How the project is primarily delivered, and of course a full blown MP service would have multiple ones listed here. Physical installation – any project that is rooted or focused around a fixed physical interactive build. The interaction is often event driven. So a few quick examples to give the above a little context – the codes here are not meant to be utilized necessarily. A3d is a casual game that will generate revenue delivered on the iPad, C5ac is a socially community driven, awareness raising video that is delivered to both mobile and 2D web and something like an alternate reality game would be delivered across a mix from each – B1,2,3,7,11,a,c,d,g. The interesting thing here is that from a budgeting perspective we can start to breakdown from the outset likely costs which is never a bad thing! There are many types of Government fund agencies from arts oriented at one end through to industrial R&D at the other. All of these like to be seen (as part of their remit) to be active in the ‘cool’ digital space. They have to justify the pages of proposals for the bigger funds with big intentions in the multi-platform sphere. But there is a problem if they all have a ‘innovation/digital/newmedia’ element. Firstly they all run them the same way – send in your ‘new media’ project ideas and we will divvy up our fund and secondly related to 1, a vague description of what this all is. This sadly divides the multi-platform pie up as 10 agencies all offering 10% of their budget and in the worse cases I have seen in the UK funding agencies running over a few months exactly the same kind of events, call for submissions and resulting half-funded, half-baked outcomes. For the creative producers navigating 10 pots of money each with a 2-3 month cycle is a nightmare and this is exacerbated by varying levels of expertise in each body. I could add the multi organisation ‘administration’ costs argument here also but I will assume you take that as a given. SOLUTION: There needs to be coordination between agencies – national level glued to regional and arts organisations working with industry focused organisations. 3rd party training and development units need to be registered and funded properly over a longer timeframe and the funding groups be clear on their outcomes. 3 Selection – Who should really choose the projects that get funding? If you rely on experts behind closed doors who have their own vested commercial interests be prepared for insider ‘manipulation’! If you rely on ‘experts’ who have no real knowledge of previous service or user culture in a specific project space, be prepared for bad judgements on the likelihood of project success. If you have a panel be prepared for all projects being voted out as is the ‘compromised’ nature of those methods. Decisions on a complex multi-platform project should be transparent and not just be a behind-the-scenes operation, using consultants or agency staff. SOLUTION: There is no single solution but a radical one funding agencies should start to consider as part of the mix (especially as it is all ‘our’ money in the first place) is online crowd sourced voting and/or event based pitching. This is now a tried and tested way for groups of people to decide on what project is likely to hit ‘its’ mark. As long as the project itself is clear on its goals then a simple overview of the project can be voted and commented on. This would also stop some of the rather ‘local’ conflict of interest activity that results from a few experts from a few companies, particularly in the fledgling industry. 4 Audiences vs Users- We can’t measure engagement so lets judge on numbers only? Audiences have become active users and use media in more complex ways but there is a persistent myth that suggests TV broadcasters, ad agencies and Box Office know their audience in great detail whereas multi-platform media have ill-defined methodologies for understanding engagement. In networked media environments this is just the opposite where the minutest details can be measured on use and engagement. Sadly the status quo is most funding bodies being swayed by traditional media creators citing bigger audiences and ad dollar while Multi-platform does not return investment and is too fragmented to deal with from a measurement perspective. A SOLUTION: The thing that is left off are funding bodies insisting on metrics – ‘any connected project must specify its measurement and monitoring of the service – define what is regarded as success or failure’. 5 Passion – Why are most funding bodies led by linear video evangelists? Who runs funding bodies and are they leading by example by creating the environment for multi-platform innovation? If their real background and passion is in film or TV drama (where auteur is king) may see multi-platform as a nice promotional vehicle for the linear property and doesn’t provide enough authorship control – in other words a superficial ‘adolescent’ adjunct. In the UK & Europe most of the staff in funding agencies are devout film/TV folk and like others who run traditional media schools for example, make occasional attempts to understand these new environments but that is often limited to a workshop or coffee chat here and there. This is reflected in the split of funding I cited above around the 9:1 ratio. This actually rises up the government chain too, where Baby Boomer politicians have not and cannot really actively be part of key aspects of multi-platform, particularly social media. A SOLUTION: Make sure inside the funding bodies there are staff who were once practitioners outside film and TV and more than that actually are regular ‘travellers’ in multi-platform environments. This does not include dabblers, those auteurs who created an iPhone app of their book or a casual game – these are people who actually live the culture of some of the ‘continents‘. 6 Advisors – In the fast evolving multi-platform world, who do you get advice from? Conception through to production – who knows about all this ‘stuff’? Consider three types of multi-platform creators. Large digital agencies – who capitalise on stable media platforms to only make a profit, quoting full price, zero innovation, cookie cutter online sites and duplicating existing multi-platform services vs story centric services. As advisors they are a good measure of maturity but fail in moving the form forward and are usually at least 3-5 years behind latest developments. Small digital producers and agencies. Can be effective in coming up with new projects but they will often try to do anything and everything to get projects and associated $$ before doing any fail forward or loss leader initiatives. They will understand what can be achieved but again are not capable at real innovation – it is counter to their risk averse culture. As advisors they are useful as a barometer of what clients are asking for but rarely see the big picture and again a few years behind latest trends. Independent creators or consultants – it is important to have a good pot pourri of individual creators or consultants who can provide independent and less self company interest advice and opinion on projects. Some may be specialised researchers in particular areas and some with working experience across the gamut so it is critical that these folk are properly categorized and vetted as there are many charlatans and self appointed experts who are more about getting consultancy $$ than truly aiding a nations multi-platform. If multi-platform initiatives are to be both adjudicated and advised appropriately then it is important to have a mix of the above – avoid only using just companies who are ‘doing-it’ as they are often more in the dark than independents who can see outside of the company balance sheet. A SOLUTION: Build an experts group that independently represents multi-platform to provide good best practise and definitions to the funding bodies. This should not be too industry focused or too academic but reflect a broad interest. Existing industry bodies are often rooted in here-and-now digital and are poor innovators so there needs to be pioneers and researchers in the mix as well as informed members or crowd sourced public community elements. 7 Education and Training – The quality of project submissions depends on the quality of training. Traditional media schools around the world are flailing far behind the times and most (perhaps echoing funding body film/tv dominance itself) are setup for tried and tested linear video only. It is often the cultural high ground that is cited, comparing ‘Gone with the Wind’-like films against ‘Grand Theft Auto’-like games as demonstrations of why non-linear platforms are irrelevant in educational or training curricular environments. Yet we have the situation of those being educated, particularly in the 14-35 age group) being the ones now least likely to be watching scheduled film or TV – spending as they do, more than half their time involved in ‘multi-platform’ services. But large media academies try to run a few modules in this stuff as supplementary (“see we do digital”) or at the other end of the spectrum vocational training schools will attempt to do it on the cheap with a few laptops and a few disconnected practitioners. It parallels the way art or music has been quashed in high school – multi-platform is seen as a soft option at higher edu levels. Then we come to training linear professionals. I could go on forever on this topic as it is one of my main activities since 1995 (BBC, AFI, LAMP, StoryLabs) namely helping good producer storytellers into the multi-platform sphere. But it is still not working. There are too many disparate, disconnected independently run 1-6 day labs and events that often confuse rather than clarify and deliver what good multi-platform storytelling is. They spread evangelical “this is the future” messages and fail on clearly imparting simple steps to devise good new projects – luckily I have been able to create labs and some higher edu Multi-Platform courses too at AFTRS and Metroscreen in the last two years and have developed a good ‘approach’ now. But part of the real problem is the ad hoc nature of these ‘special’ training and mentoring initiatives which tend to be ‘send us your cool project and we will get you to talk about it with experts’ events. Very little real upfront definition or backend nurturing takes place. The event is a one off evangelical trigger with, if your lucky, a bit of a hands-on workshop. This a global issue. A SOLUTION: Funding bodies globally do two things. 1 – Have a list of recognised training units who are clearly tasked with outcomes relevant to the funding bodies ‘defined’ goals. 2 – Have a global directory of independent specialised consultants and fleet of foot companies who can provide good pre and post event executive type roles in the project. StoryLabs is one unit moving forward with 2 at least. 8 Funding Levels – Even with the low level of support to MP projects, what is each project worth? Lets assume a project presses all the right buttons and is clearly defined (as below) why are there crudely defined funding levels. We see everything from pitch competitions to win a few grand through to some funds that are offering $100s almost oblivious to the fact that some things are much cheaper than others and some areas of multi-platform especially games (console and below) can be very high. At the moment it is send us a fully budgeted (find your own financial advisors) story centric (find your own transmedia consultants) multi-platform project and try to fit it inside these levels of funding. This promotes samey type submissions all shoe-horning a wide range of projects into a single funding box – “try and make it for $50k or less please”. 9 Keeping Up – Are funding bodies way behind the actual changes that are happening? Film or TV may have an impact that lasts minutes or hours after the broadcast spots yet good interactive, multi-platform story may keep users engaged for months, years. Sure we may watch a linear video property a couple of times but this is a long way from ‘contributing’ content and discussing, playing, watching and networking around a good story based multi-platform offering. This is a big shift but companies and funding agencies by the time they have put their systems into place are often factors of years behind any new trends. If there is a decision to ignore new platforms or new formats and only concentrate on current media potential their country will fall behind in creative innovation. Industry self published figures will always support their status quo case as a matter of self-preservation – yet some funding & academic organisations base key decisions on what an industry needs in terms of financial assistance or resources on reports from those self interested industry bodies. A SOLUTION: Be willing to publish the metrics (see 10) and use comprehensive research methods to look inside and outside of industry figures. Become more reliant on solid independent research looking primarily at audience usage vs pure sales/money or time-spent reports. Use social media more in garnering public interest, this goes way beyond making a Facebook page but using a gamut of Social tools to connect with the ‘investors’. 10 Measurement – Is funding by not expecting a return (metric or monetary) setting up failure? Finally and I have saved one of the most critical ones to last. I am always shocked when I hear that projects get funded but are not held accountable. There are no penalties if your ‘community website’ got less than 100 people signup or that great casual game actually lost money. The project creators a year later submit another idea that has the same ‘we have not built in ROI/KPI’ attitude and for whatever reason get funded again. Not setting any measure of success or failure is one of the really broken parts of public funding. A SOLUTION: Key Performance Indicators KPIs should be used as a major part of any submission. The multi platform projects (and linear ones to that extent) need to state how they consider the project will succeed or fail. Did it generate the $100k profit in the first year, did it have 5mill impressions across the measurable web, did it break even at the box office, how many actually watched the range of costly web videos, how many turned up for the 3D projection mapping event? Monitoring projects post funding needs to be resourced, if it can’t be measured it shouldn’t be funded, period. OK it is easy to come up with ‘whats wrong’ lists and provide brief solutions but I hope it may you think what could ‘multiple media’ funding be in a future not limited or constrained by any of the above barriers? Lets consider fresher approaches. Imagine a country that has just been asked to create a content industry based on what its peoples are currently doing – without 110 years of film or 50 years of TV or 1000s years of book heritage to confuse distribution & format considerations. Looking presently at usage of media and devices can we truly create something that means creative producers really get a chance and are not sucked into backward thinking companies creating 5 years ago, ‘digital’ projects? The country that really removes itself of the shackles of incumbent heritage media and publicly finances original multi-platform thinking is one I would like to be in. Great post Gary, with considered and well researched arguments and evidence. A good overview. I’ll add another problem. Government funding bodies discriminate against industry producers and creatives who learnt their craft on the job in real world commercial companies. I was once told to my face that even though the independent assessor recommended funding our film, we were not getting any financial support because the director and I did not have a traditional backgrounds i.e. were not graduates of AFTRS or VCA. 15 years each of industry experience, invitation to screen at an international film festival and completed productions meant nothing! Another film project which went overseas with the writer to be optioned by Kubrick just before his death in 1999 was rejected here by another government funding body. The only reason given was the application was not “professional”. The assessor was referring to the document formatting, specifically the font size of the section headings. I don’t think she even read it. No wonder we lose people overseas. I would like to see more funding for transmedia ventures with has a business plan that includes how the project will be promoted and sustainable. That’s because we have an emag / lifestyle TV/ mobisodes/ online webi-tablisodes and webcast / live events proposal that fits. Sadly, I have no faith that a government funding body will read the business plan in full and understand it, let alone fund a producer with 30 years real world experience including live events, film, TV, web and mobile phone series. "@GaryPHayes: Archive: : 10 Reasons Public Multi-Platform Funding is Broken & Ways to Fix It t.co/hQn8a2Gl&quot; an old post but relevant.